Call Me Jorge...: "I spy with my little eye something hidden..."
"I spy with my little eye something hidden..."
Have you ever played the childhood game I Spy? "I spy with my little eye something hidden..." What is Francis hiding in the above photo? OK, we'll give you a hint...it is something Francis is very fond of. Any guesses? Yes, you guessed it correctly his pectoral cross is hidden. 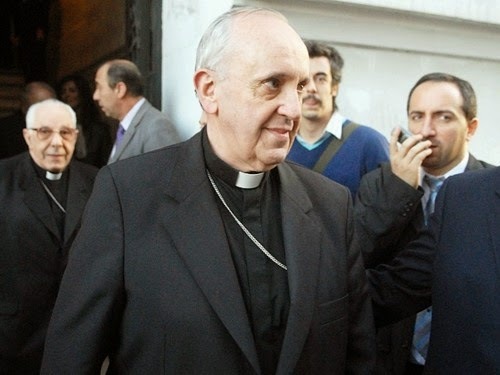 Remember when immediately after he was elected Francis rejected the gold pectoral Crucifix his master of ceremonies had chosen for him and instead kept the silver pectoral cross he wore as a bishop in Argentina? He was so proud to show it to the world and have the mainstream media gush over how it showed he was humble. So why is he hiding it now? 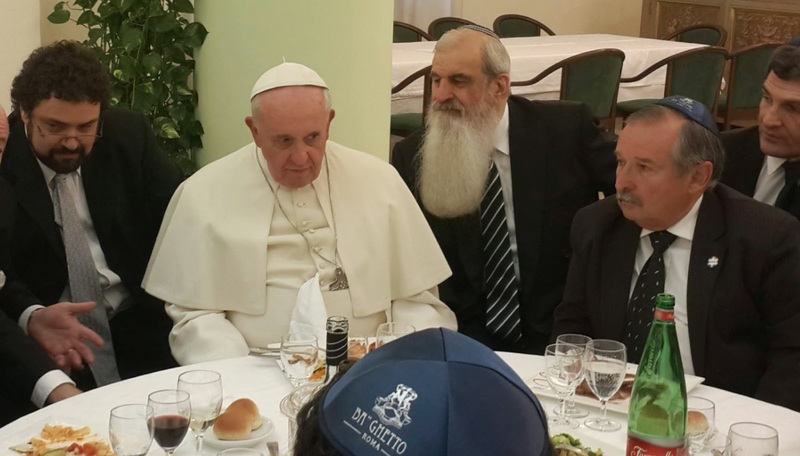 Always the politician and wanting to be a ger toshav to his Talmudic friends, Francis slyly tucked his cross into his fascia at the kosher 'Last Lunch'. See our dear readers, the shape of the cross is offensive to the rabbis. 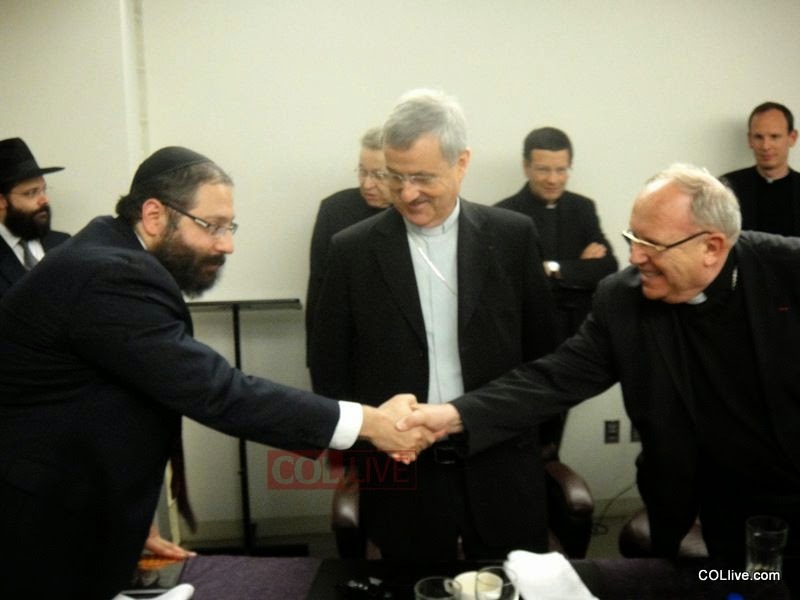 Is the Vatican now a yeshiva? We will soon have more to say on the kosher 'Last Lunch' which took place at Domus Sanctæ Marthæ in the Vatican City State on 17 January 2014. Until then, here are a few more photos where you can play I Spy? the hidden... pectoral cross. Why are you so surprised? 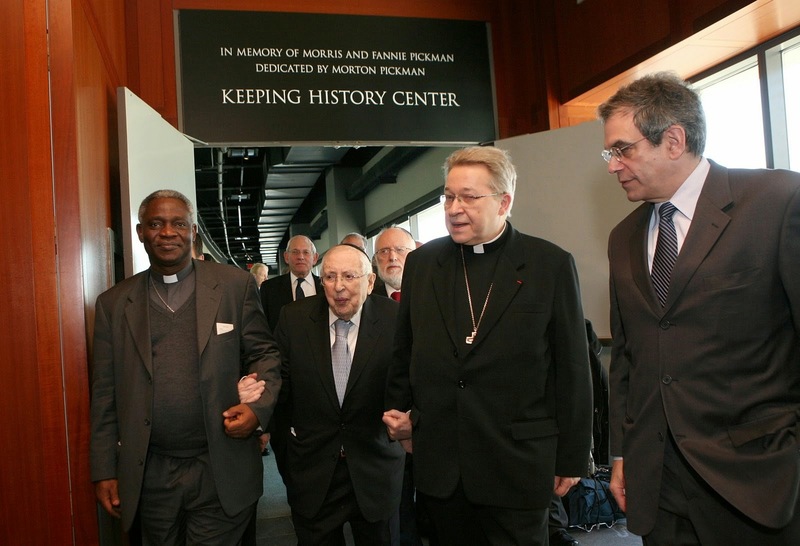 The post-conciliar church is liberal modernist and the very enemy within referred to by Pope St Pius X in "Pascendi Dominici Gregis....." These modernists are all moral cowards hiding behind relativism and their "primacy of conscience" - indeed, consciences formed by the protestant anthropocentric and anathematised Novus Ordo liturgy fabricated by the self-excommunicate [latae sententiae] freemason Mgr "BUAN" Bugnini the architect of systematic subversion and disunity of the contemporary church. There is your post-modernist papacy - made up of gays, moral relativists, apostates and whited-sepulchres: 49 years of them, in fact. Likewise. I cannot believe my eyes. Suor Cristina - Sister Act?